Happy Virtual Baby Shower Day to my sweet friend Erin from The Speckled Palate! Erin is one of my closest blogging friends and I am so excited to join together with a handful of bloggers to celebrate her and baby Speckle, due in just a few days! When I studied abroad in Italy, I decided it was time to try to learn to like wine. I’m so glad that I did because now I can enjoy a glass of wine with my husband or with friends. It’s also been so fun to learn more about pairing wine with food and even cooking with wine. So Moscato Cupcakes, for a baby shower? Well, yes. Because they are fancy and fun. Because the wine is used in the batter, it’s cooked out while baking. 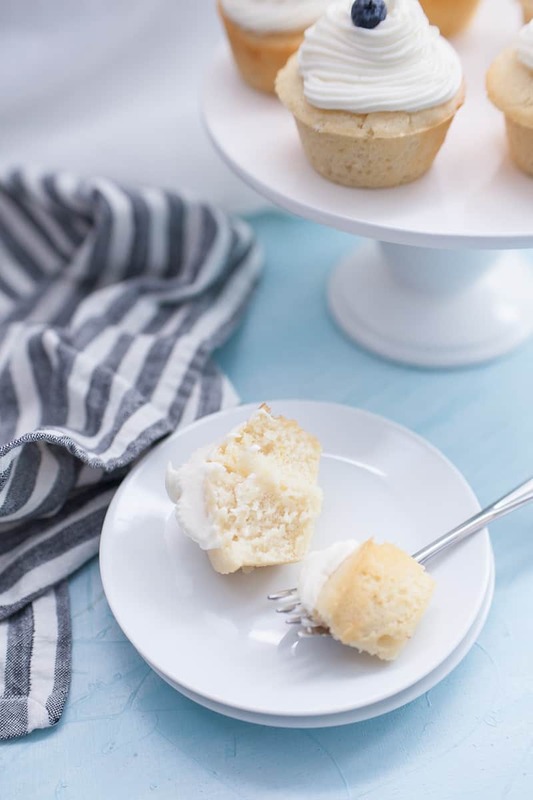 But if the mama to be you are celebrating wouldn’t be comfortable, you can leave out the moscato and you still have crisp, sweet and light cupcakes to celebrate! The alcohol in wine will bake out while cooking, so this is the perfect recipe to use for occasions where someone may not be able to drink alcohol. 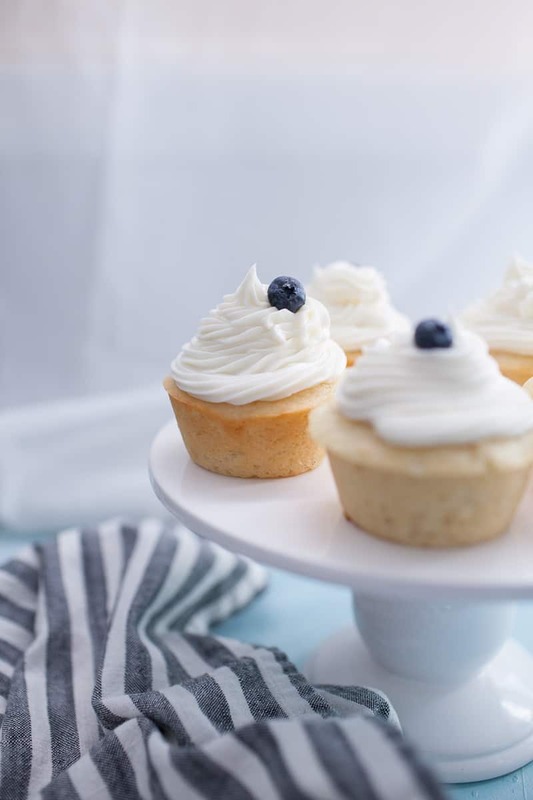 If able, you can also add moscato to the icing for these cupcakes for a fun taste upgrade! Make sure you bake cupcakes until they bounce back when gently touched or a toothpick comes out with cake crumbs on it. Batter on the toothpick means the cupcakes are underbaked and a clean toothpick means the cupcake is too dry. Cooling on a wire rack lets the cupcakes cool completely. In a pinch cool the cupcakes on the wire rack in the fridge. But for the best, fluffiest cupcakes, cooling at room temperature is recommended. What else can I serve at a baby shower? So glad you asked. Here are the other fabulous bloggers joining me for Erin’s shower! Preheat oven to 350º F. Grease a 12 count muffin tin, set aside. Cream together butter and sugar. Add egg, yogurt, moscato, vanilla and lemon zest. Combine wet and dry ingredients, gradually adding dry ingredients to wet. Scoop the batter into the prepared muffin tin, filling each about 3/4 full. Bake for 21-23 minutes or until cupcakes bounce back when gently touched. Cool completely on wire racks before frosting. Place the butter in a mixing bowl and beat on medium speed. Add in the moscato, beat for 1 minute. The mixture will not be smooth. Gradually add powdered sugar in until desired thickness is reached. Cupcakes will bounce back in the center when fully baked, but a toothpick will have some crumbs on it. Omit moscato in icing for a non-alcoholic version. I occasionally cook with wine. I’ve never tried cupcakes though but these sound delicious. My fave wine dish is probably Chicken Marsala. Ooh chicken marsala is so good! It’s funny…I can’t drink wine because it gives me headaches so I prefer to “eat” my wine! We put wine in so many of our sauces! I would “eat” wine then too!! I love adding it to sauces, it adds so much flavor! Oooh yum!! That sounds great. Steven would love it! I AM TOTALLY GOING TO TRY THIS. Moscato is my favorite wine anyway! You have combined two of my favorite things into one! These are a must have for my next girls night! Yes, it would be so fun!! I’ve actually never cooked with wine except for the wine wings my mom makes when the whole family begs her to, but I should definitely give this a try! 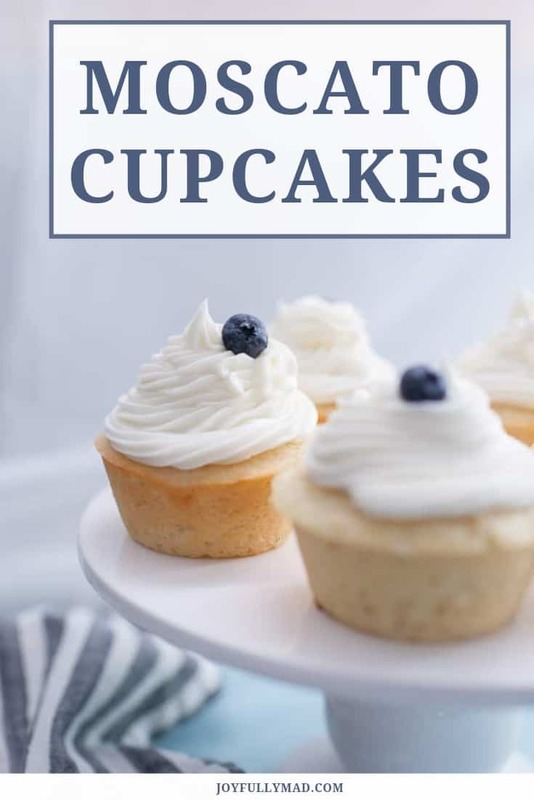 I love cooking with wine (adding it to sauces or in meat dishes are my favorite) but I’ve never thought of adding it into cupcakes. I’ll definitely have to try this sometime! I hadn’t either, but it was so good! I love moscato! And cupcakes! I have to try this! I’ve cooked with wine before, but usually just red wine. 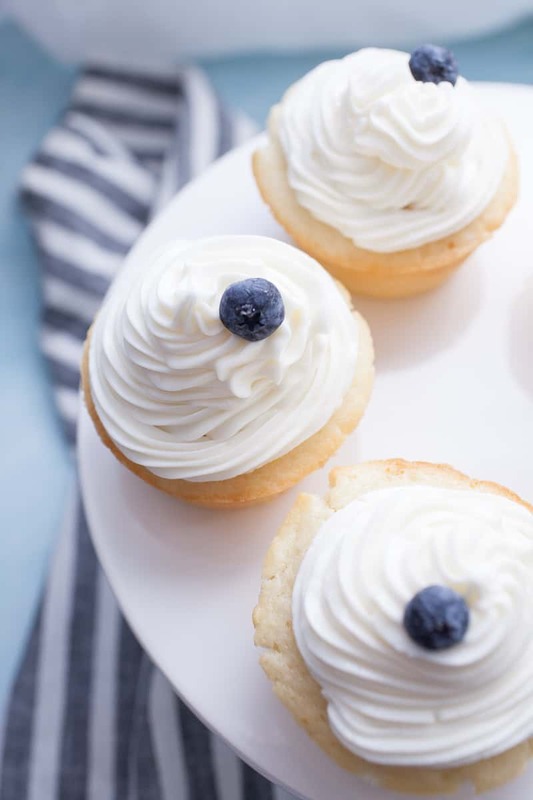 I only like drinking white wine though, so I feel like I need these cupcakes in my life ASAP! Yes, you do girl! I prefer white wine, too! uh YUMMMMMMMMMMMMMMMMMMMMMM i would have never thought of that! It’s so fun! Now I’m wondering all of the other ways I’ve missed out on using wine in cooking. I know, why had we never though of this before?! I’mma be honest – you had me at the title. 😉 Seriously though – these sound awesome! And perfect for the holidays. 🙂 Looking forward to giving these a try! Girl, stop, You’re speaking my language when you combine my favorite beverage with my favorite dessert! I’ve done red wine cupcake before, but not moscato! I bet these are divine! Pinning all over this! Were they chocolate cupcakes? I saw some recipes for chocolate cupcakes with wine frosting. These look incredible! I’ve never tried cooking with any type of alcohol, but I have tons of birthdays coming up and I think these will be a hit! Thanks Marissa! Wine is great in sauces, too! I love that you say you decided to learn to like wine while you studied abroad. I had the same revelation with beer when I studied abroad in the Czech Republic! 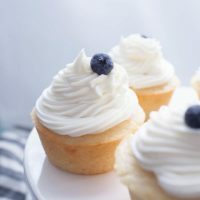 These cupcakes sound to die for and I will definitely have to try them! Mmm these look tasty! I love the pics! These sound really good! I think I might be adding this recipe to my list to try. Mmmm I made moscato cupcakes for my birthday 2 years ago and they were a HUGE hit! Umm yeah so moscato and cupcakes are two of my favorite things. How have I not combined them yet?! Hahah, thanks for the recipe! Now you can!! 😉 I hope you love them! wine and cupcakes? count me in!! Madison, these photos are BEAUTIFUL. And now I NEED a cupcake. Yes… you REALLY do need one. They are SOO good. I’m sad they are gone now! Thank you! Your fam will love them. Love the sound of these cupcakes! They look so light and fresh, perfect for a baby shower. I bet these are moist and amazing! Yum! They are SO fluffy inside and so crisp tasting! These are perfect for a shower Madison! I’ve never tried baking with wine, but sounds like a must try!